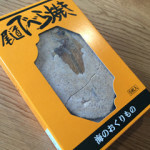 Shiga prefecture has some representative souvenirs such as Oomi beef, Funa-zushi (crucian carp sushi), red konjac and so on. 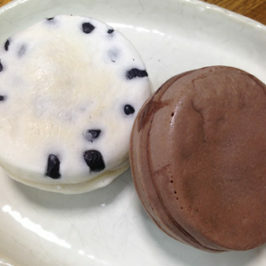 However, you must not forget delicious and unique wagashi (Japanese style sweets) loved by tourists from all over the world. 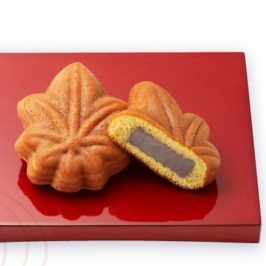 I am pleased to introduce to you about interesting Japanese style sweets with various historical backgrounds. Mt. Aisaka Oiwake, (Otsu City, Shiga Prefecture) which separates Otsu-city from Kyoto-city, has been a famous district for exquisite and well-Conserved waterssince the old days . “Hashiriimochi” is a representative wagashi of this area. 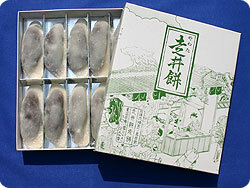 The mochi (rice cake) is made from the special water and speciality rice of Oumi district. 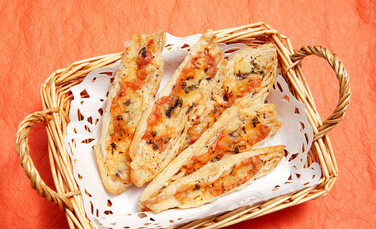 I guarantee you will enjoy its soft and handmade simple taste. 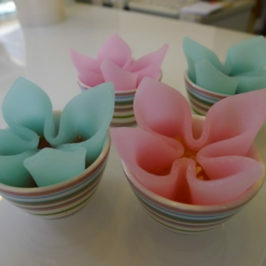 Let’s take a look at the history of this wagashi. There has been a well (Ido in Japanese) with clean water overflowing with great force since the old days in Aisaka Oiwake district, and it is called “Hashirii (a well where water runs). 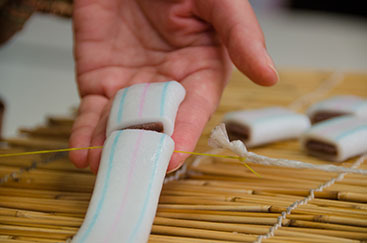 The unique shape of Hashiriimochi expresses a drop of water flow of abundant water. 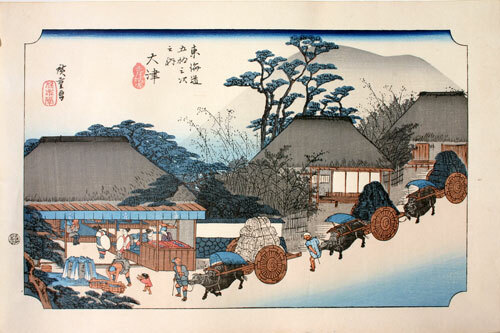 In the Edo Period many tea houses were built around it and this place became an oasis for many travelers. 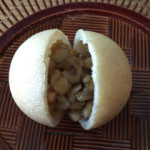 Mochi-gashi (sweet bean-jam rice cake) , which started to be sold there, is the beginning of Hashiriimochi. 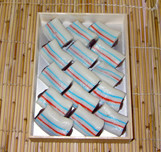 The confections satisfied the hunger of many travelers and became an important energy source for them. The reputation spread around and It became known to people all over Japan. 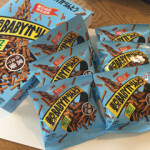 It received the 23st National Confectionery Exposition Honorary President Award. 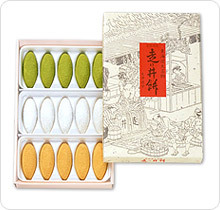 There are 3 kinds of flavors: plain mochi, maccha (powder green tea) and kinako (roasted soybean flour). Taga Taisya (big shrine) is the biggest and most famous shrines-in Shiga prefecture. 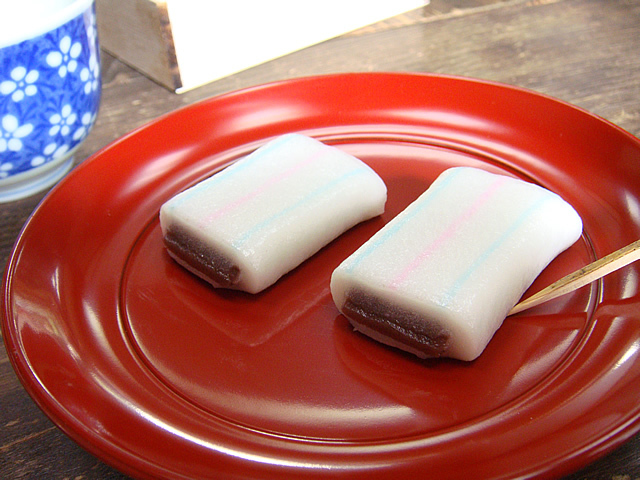 “Itokirimochi” is one of the most popular representative wagashi souvenirs of Taga district. 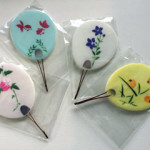 Whenever people visit Taga Taisya, they buy it as a souvenir. 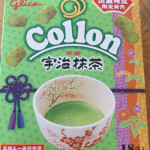 This Japanese sweet has interesting historical background, too. Long ago, Japan was attacked by the mongolian army. This incident was called “Genko”. Japanese samurais(armies) fought desperately, and fortunately,a typhoon came and destroyed the Mongolia forces. 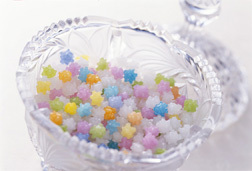 People, very happy that peace returned, made confections and offered those to the spirit of the deceased. It is the beginning of “Itokirimochi”. These red and blue lines express the war flag of Mongolia. It is called “Itokirimochi (thread rice cake)”. People named it because they cut a dumpling rice cake in bowstring (thread). It is modestly sweet and delicious. However, make sure to eat it soon as it does not have a long shelf life. Shiga has Lake Biwa in the middle of the prefecture, which is the largest lake in Japan , and it is a livable place full of nature. Additionally, it is conveniently located, – You can easily get to cities . You can go to Osaka within approximately 50 minutes, and to Kyoto within approximately 30 minutes by train. 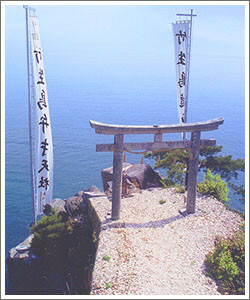 Shiga prefecture has many well-kept secret tourist attractions, and one of them is Chikubu-shima (island) Shrine, which is the national treasure in Japan. Chikubu-shima is an island in Lake Biwa. We can enjoy a bit of adventure on the way to the Shinto shrine: getting on board ship, landing on the island and walking onthe mountain path.